The Midway Class Aircraft Carriers DVD is a collection of films and newsreels on the famous CVB Midway Class Aircraft carriers. They were the Navy's first armor plated deck aircraft carriers, and were conceived in 1940. The first of their class was the USS Midway, CV-41. Her keel was laid down in 1943, and was commissioned in Sept 10th, 1945, one week after the war ended with Japan. The Midway class carriers became the largest ships in the world until 1955, and at 972 ft long and a beam of 113 ft, they also were the first Navy ships that couldn't pass through the Panama canal. The big difference between the Midway Class and the famous Essex Class carriers was the armored deck vs the Essex's wooded deck. This also led to a complete design change. To accommodate the weight, the ships had to be bigger, wider, and lower to compensate for the greater weight from the 4 inches of steel armored deck. The USS Midway has served for 47 years of continuous service and all three Midway class carriers served in Vietnam. The USS Midway even served in the War with Iraq, "Desert Storm". We hope you'll enjoy this DVD. Film #1 - USN Carrier History - This a great history of the importance of the USN carriers, from USS Langley CV-1 to the construction of the Yorktown class, to Essex class to the Midway class and finally, the 1st nuclear carrier CVN-65, USS Enterprise. Runtime is about 17 minutes. 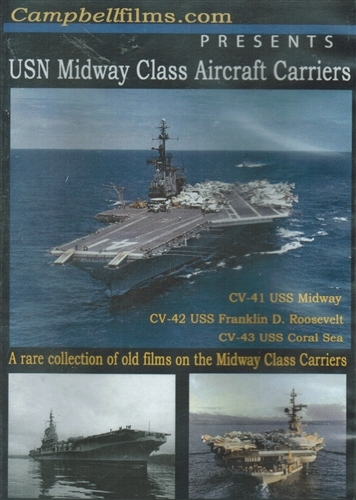 Film #2 - The USS Midway, CV-41 - This a great story about the early days of the USS Midway CV-41 at sea. This rare film shows the USS Midway as a "straight deck" carrier with F8F Bearcats and AD Skyraiders in use, plus a few jets onboard. Runtime is about 9 minutes. Film #3 - A Day aboard the CV-42 - In 1957, a film crew got to go aboard the USS Roosevelt for a day. Great footage of the ship in action too. Runtime is about 12 minutes. Film #4 - The Battle of the Coral Sea and Midway - This film is from the 1952 series Victory at Sea, called Midway. This episode tells the story of how Japan took over almost all of the Asian Pacific region and was only stopped at the Battle of the Coral Sea and Midway. Japan never recovered after these battles. These great battles are where the Midway class got their names. This is a great story. Runtime is about 26 minutes. Total runtime for the Midway Class Aircraft Carriers DVD is about 92 minutes. Format is NTSC DVD and region-free.